An environmentally friendlier alternative to PVC Foamboard. Manufactured to the highest quality in the UK. When you dispose of PVC foam it can be incinerated giving off dioxins which are one of the most toxic substances produced by mankind. Foam Polystyrene contains no PVC so gives off no dioxins and it is CFC free. 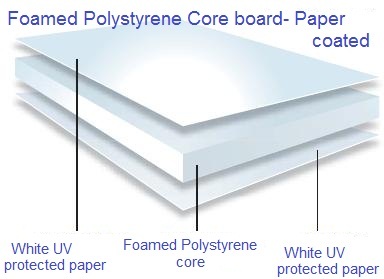 It is a medium density board made with a white Polystyrene core. The surfaces are covered with white paper which is a perfect substrate for direct to substrate digital printing with UV curing inks as well as with solvent based inks. It can also be used for screen-printing applications such as event marketing and promotion campaigns and high quality signage. Very Low cost - Sold in packs - See below. Easily processed. Cuts easlily with a sharp knife. Foam polystyerene has excellent printability as it is covered with white paper. Foamed Polystyrene is much more rigid than expanded polystyrene foam at equivalent thickness. When mounting, allow for dimensional change due to thermal expansion and contraction and drill oversized holes and use washers. Do not screw too tightly. Foam Polystyrene board is made with a white polystyrene core and each surface is coated with a white paper suitable for printing and painting with suitable inks and paints.